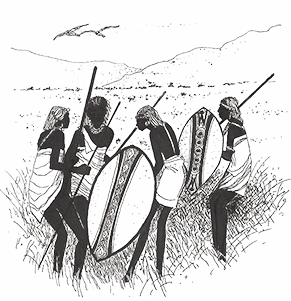 AbaGusii or more common Kisii people are a tribe located on the western parts of Kenya near Lake Victoria. This single showcases straight from the roots benga in luo tradition, bouncy tempo with drive and the guitarist shifting dynamics gives the track a certain cosmic appeal. The release also goes into A. P Chandaranas treasure trove of Kenyan and Tanzanian released music. The label was distributed from the small town of Kericho. If anyone can enlighten us with identification of the platter object shown on the label we’d be delighted. 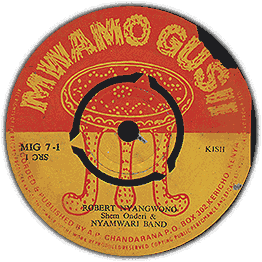 Any chance of hearing “Mwamo Gusii” Please great and would be eternally grateful. ‘Ebisio Bia Byasae’ B-SIDE added as you requested. The “platter object” is, in fact, a three legged stool with elaborate bead inlays. I have one made by Luo craftsmen that looks very similar though I would expect this one to be modeled after something made in Kisii.